Monoject 140 mL Piston Syringe from HealthyKin.com is a general purpose syringe with bold dual graduations: 140mL in 5mL increments and 5 oz. In 1/4 oz. increments. 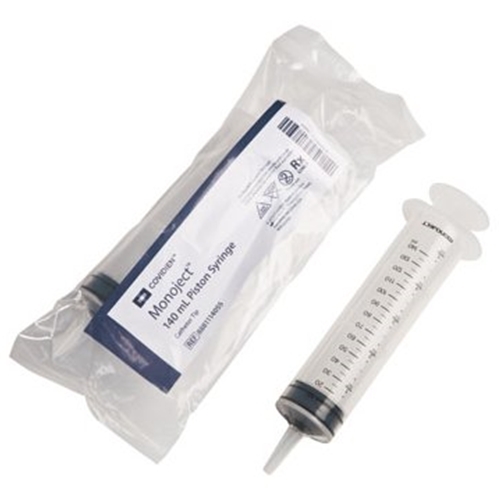 This is an excellent product for tube feeders to use in bolus feeding situations, such as travel, etc.. This large size syringe is hard to find, and can be harder to actually obtain. Healthy Kin turned out to be a responsible supplier, providing very timely product shipment at a great price. Product worked very well. Shipment came very quickly. Great price! Great product! love it! Great for getting the job done.